On our return to Fiji, government officials receiving our scientific results, discussed the benefits of Marine Protected Areas (MPAs). When we collected the data for our research, we saw first hand how an MPA can transform the marine environment. Holothuria edulis – pinkfish sea cucumbers found in Mavana MPA. Ron recorded an average of 97 total sea cucumbers per hectare. This was more than 10 times higher than what we have generally observed throughout most of the Lau Group. This survey is part of the Living Oceans Foundation Fiji leg of the Global Reef Expedition. 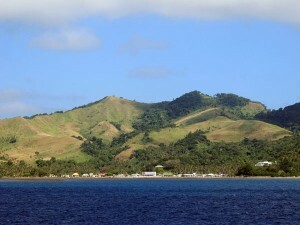 Vanuabalavu Island, Mavana Village site of their MPA. Fiji established he Mavana MPA in 2007. This is ample time for certain fast growing taxa like some parrotfish and surgeonfish to grow, reproduce, and recruit to the MPA. It is some positive news that when local communities are committed to their management, fish and invertebrate stocks can be protected from overharvesting and recover. Meanwhile, the Mavana MPA offers protection from the sea cucumber frenzy that has ravaged the Lau Group. 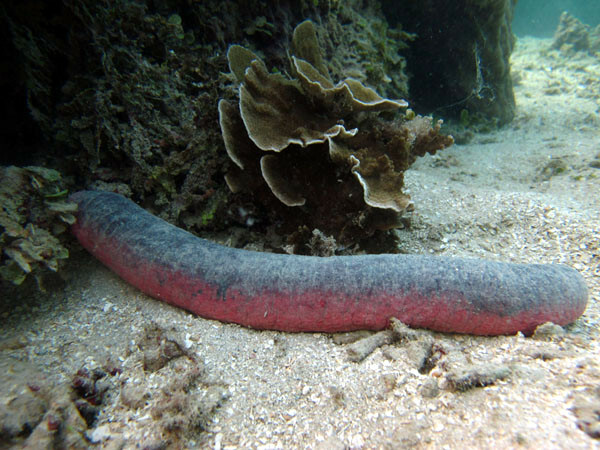 In one instance last year, the son of the chief from Susui village came over to Fiji’s capital Suva for a management awareness workshop, only to make connections with an Asian export company that he enticed back to harvest all of the sea cucumbers from the Susui marine protected area. The people of Mavana have so far resisted this temptation. We are hopeful that once they receive the findings from our surveys, they will continue their stewardship over the reef.